​After everyone has finished eating, refrigerate leftovers within 2 hours instead of leaving them out for people to nibble on. This not only reduces the chances of foodborne illness, it also reduces consumption of excess calories. Keep in mind that travel time is included in the 2-hour rule. So, keep hot foods hot and cold foods cold during transportation and service, and always refrigerate leftovers and any type of food that requires refrigeration within 2 hours, including that pumpkin pie. 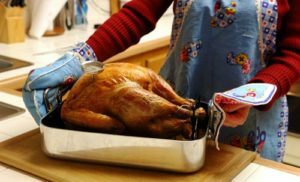 What can you do to make sure your family and 4-H club members avoid foodborne illness at your next holiday party? Clean all surfaces, including your hands, before, during and after food preparation; separate raw foods from ready-to-eat foods; cook foods to the appropriate internal temperature; and chill leftovers within 2 hours. These four basic food safety measures can make the difference between a positive and negative experience for you and your guests. 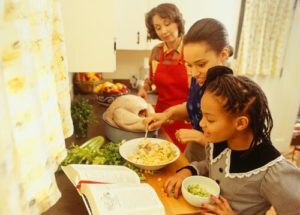 If you are in an Indiana 4-H club or are a 4-H club leader in Indiana, consider incorporating these food safety measures into a cooking lesson or holiday meal preparation.